CPAESS employs 158 plus staff in multiple locations around the country. See Staff page for full listing. 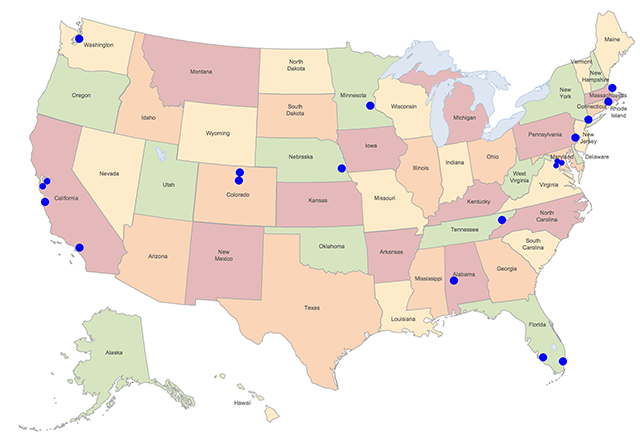 Our locations include federal agencies (Air Force Weather Wing Agency; Coupling, Energetics, and Dynamics of Atmospherics Regions (CEDAR); NASA Ocean Observations; National Centers for Environmental Prediction (NCEP); National Hurricane Center (NHC); National Ocean Service; Naval Research Laboratory (NRL), NOAA Climate Program Office (CPO); NOAA Geophysical Fluid Dynamics Laboratory (GFDL); NOAA National Centers for Environmental Information (NCEI); NOAA National Environmental Satellite, Data, and Information Service (NESDIS); NOAA National Weather Service (NWS) Climate Prediction Center African Desk; NOAA Ocean Acidification Program (OAP); NOAA National Office of Water Prediction (OWP)) program offices, laboratories, administrative offices, universities, or research locations. The Boulder office of CPAESS, located at UCAR's Foothills Laboratory, is home to 19 full and part-time UCAR employees dedicated to fulfilling the CPAESS mission of providing customized solutions that advance research capacity, build collaboration, and foster scientific leadership and workforce development.